The FIFA Referees Committee has selected 36 referees and 63 assistant referees, representing 46 different countries, for the 2018 FIFA World Cup Russia. 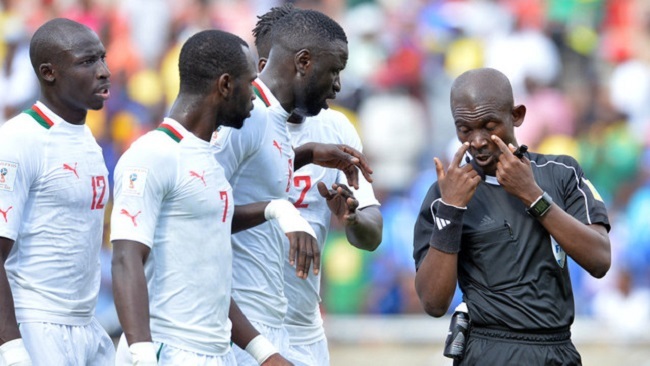 Out of the number, 16 match officials are from Africa. The contingent comprises six referees and ten assistants. Preparations for the road to Russia kicked off in September 2014 not only for the 32 participating teams, but also for the initial group of 53 FIFA referee trios from around the world. The choice of the final group of match officials selected to officiate at the 2018 FIFA World Cup Russia was based on each referee’s skills and personality, as well as his level of understanding of football and ability to read both the game and the various tactics employed by teams. Over the last three years, preparatory seminars have taken place for referees and assistant referees focusing on fair play, protecting players and the image of the game, as well as consistency and uniformity. The selected FIFA World Cup match officials will attend another dedicated seminar for two weeks in the second half of April at the technical centre of the Italian Football Association in Coverciano, Italy. The officials will be divided into two groups, which will also include video assistant referee (VAR) candidates. Following this seminar, the FIFA Referees Committee will announce the names of the referees selected to act as VARs during football’s most important competition, the FIFAWorld Cup. The selection process will take into account the candidate’s VAR experience in domestic leagues, FIFA competitions and FIFA refereeing seminars since the beginning of the VARproject in 2016. Between now and the World Cup in June, the selected referees, assistant referees and VARs will be monitored and supported by FIFA Refereeing on an individual basis to ensure they are fully prepared. Following the seminar in Coverciano, all of the match officials will take part in a final preparatory seminar at the FIFA World Cup match officials’ HQ in Moscow, which will start ten days before the tournament kicks off. This seminar will also cover VAR. During the 2018 FIFA World Cup™, the selected match officials will operate in a variety of roles, e.g. referees, assistant referees, fourth officials, reserve assistant referees and video match officials.